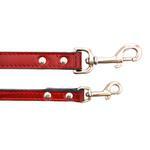 Take your dog on a walk in this stunning Manhattan Patent Leather Dog Leash by Auburn Leather in Red! Auburn LeatherCrafters brings on a classic and stylish look to the streets with the Manhattan Patent Leather Dog Leash by Auburn Leather. Nickel swivel hook and connections adorn this top grain leather. Beveled and hand polished edges with black bridle leather backing. Made in the USA! Matching collar sold separately.